What Makes Canada Copy Special? We don’t believe in Gimmicks or Hassles or Ripping fees. The price per copy that you see is what you pay. Furthermore, if your total order is more than $250, we will ship your order to you for free in Souhtern Ontario and Quebec. We have provided a comprehensive list of different document products and different configurations. However, we realize that we cannot anticipate everyone’s needs. If you cannot find an item that works for you, please email us at quotes@canadacopy.com and we will be happy to give you a quote on your exact specifications. No matter how big or complex your order is, we are capable of producing it for you. In fact, our production facility is capable of producing more than 1,000,000 copies per day. At CanadaCopy.com we understand that you work hard for your money and we want to help your bottom line. 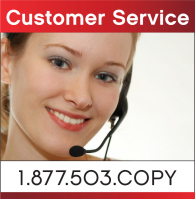 We are committed to providing you with the highest quality copies at the lowest possible prices.